IRVINE, Calif.--(BUSINESS WIRE)--Masimo (NASDAQ: MASI) announced today the release of UniView™, an integrated display of real-time data and alarms from multiple Masimo and third-party devices, designed to reduce clinician cognitive overload and improve patient safety. UniView promotes data sharing and team coordination among multiple clinicians. UniView solves these problems by bringing together data from a variety of sources – such as patient monitors, ventilators, anesthesia gas machines, and IV pumps – and providing a supplementary display for them, clearly organized, on one or more large, central monitors, so that all clinicians can simultaneously view and act upon the same, comprehensive real-time patient status and historical trends. 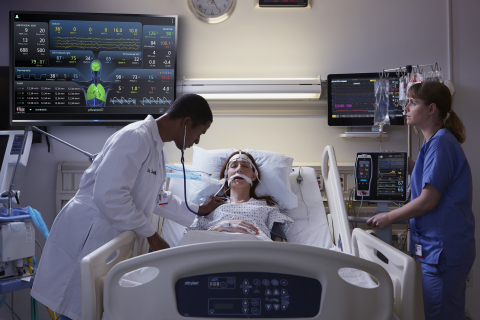 Visual alarm indicators, relayed from the connected devices, help clinicians recognize patient distress and target areas for immediate focus. UniView is suitable for any area where comprehensive, logically organized, and timely data are key to supporting good clinical care. In Hemodynamics layout, view trend data for noninvasive hemoglobin (SpHb®), pleth variability index (PVi®), and pulse rate to aid in visualizing patient status over time. In Sedation layout, view high-fidelity EEG waveforms, patient state index (PSi), and anesthesia machine data to monitor a patient’s sedation. In addition, hospitals will be able customize the view as preferred and even take advantage of individual customization using Masimo MyView™ technology. This press release includes forward-looking statements as defined in Section 27A of the Securities Act of 1933 and Section 21E of the Securities Exchange Act of 1934, in connection with the Private Securities Litigation Reform Act of 1995. These forward-looking statements include, among others, statements regarding the potential effectiveness of Masimo UniView™, Iris Gateway™, and Patient SafetyNet™. These forward-looking statements are based on current expectations about future events affecting us and are subject to risks and uncertainties, all of which are difficult to predict and many of which are beyond our control and could cause our actual results to differ materially and adversely from those expressed in our forward-looking statements as a result of various risk factors, including, but not limited to: risks related to our assumptions regarding the repeatability of clinical results; risks related to our belief that Masimo's unique noninvasive measurement technologies, including Masimo UniView, Iris Gateway, and Patient SafetyNet, contribute to positive clinical outcomes and patient safety; risks related to our belief that Masimo noninvasive medical breakthroughs provide cost-effective solutions and unique advantages; as well as other factors discussed in the "Risk Factors" section of our most recent reports filed with the Securities and Exchange Commission ("SEC"), which may be obtained for free at the SEC's website at www.sec.gov. Although we believe that the expectations reflected in our forward-looking statements are reasonable, we do not know whether our expectations will prove correct. All forward-looking statements included in this press release are expressly qualified in their entirety by the foregoing cautionary statements. You are cautioned not to place undue reliance on these forward-looking statements, which speak only as of today's date. We do not undertake any obligation to update, amend or clarify these statements or the "Risk Factors" contained in our most recent reports filed with the SEC, whether as a result of new information, future events or otherwise, except as may be required under the applicable securities laws. Masimo announced the release of UniView™, an integrated display of real-time data and alarms from multiple Masimo and third-party devices.